Research scientists need to write well, but if resume writing doesn't come easily, experiment with this sample resume for a research scientist. To be a successful candidate for research scientist jobs, resume expert Kim Isaacs says it helps to have a comprehensive resume. Research scientists must have excellent written communication skills, but if resume writing doesn't come easily to you, experiment with this sample resume for a midlevel research scientist that Isaacs created. You can also download the research scientist resume template in Word. Good news: Jobs for research scientists are projected to grow by 13% (Or 16,100 jobs) from 2016 through 2026, which is faster than average, according to the Bureau of Labor Statistics (BLS). In terms of where the industry is flourishing, you’ll find the highest level of employment for this job in the following states: California, Massachusetts, New York, Pennsylvania, and Washington; and in the following metropolitan areas: Boston, New York City, Los Angeles, San Francisco, and Seattle. When it comes to salaries, as a research scientist, you can expect to make a median wage of $82,090 per year, or $39.44 per hour, according to the BLS. Additionally, you can learn more about science careers on Monster. Patented devices generating $58M in 2011. Next-generation polymer-based organic light-emitting diodes (POLED) technologies with quality nearly equal to SMOLEDs for less than half the cost. Fully integrated circuit and system solutions that delivered new bests in speed, power, frequency, reliability, linearity and yield. 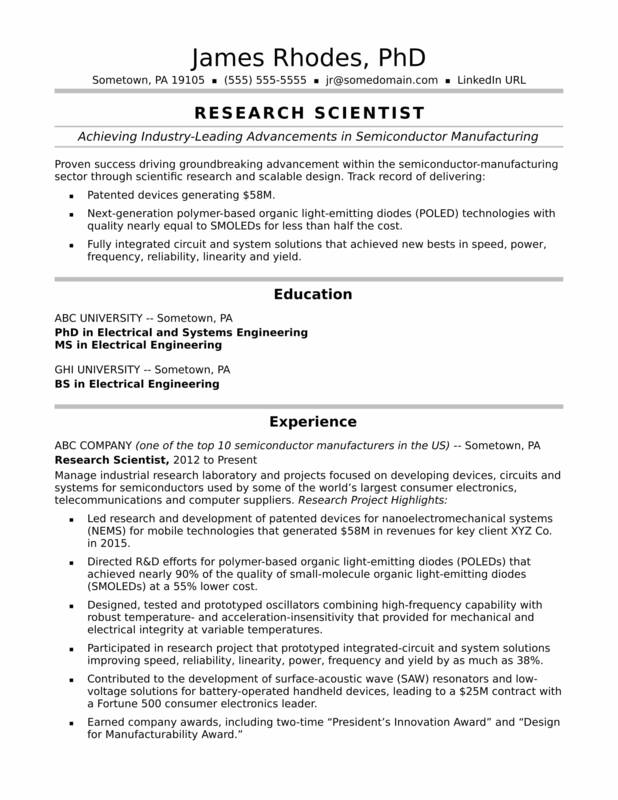 Manage industrial research laboratory and projects focused on developing devices, circuits and systems for semiconductors used by some of the world’s largest consumer electronics, telecommunications and computer suppliers. Led research and development of patented devices for nanoelectromechanical systems (NEMS) for mobile technologies that generated $58M in revenues for key client XYZ Co. in 2011 alone. Directed R&D efforts for polymer-based organic light-emitting diodes (POLEDs) that achieved nearly 90% of the quality of small-molecule organic light-emitting diodes (SMOLEDs) at a 55% lower cost. Designed, tested and prototyped oscillators combining high-frequency capability with robust temperature- and acceleration-insensitivity that provided for mechanical and electrical integrity at variable temperatures. Participated in research project that prototyped integrated-circuit and system solutions improving speed, reliability, linearity, power, frequency and yield by as much as 38%. Contributed to the development of surface-acoustic wave (SAW) resonators and low-voltage solutions for battery-operated handheld devices, leading to a $25M contract with a Fortune 500 consumer electronics leader. Designed, conducted and completed research on the design and fabrication of high-frequency oscillators as well as high-quality factor vibrating mechanical structures. Co-authored grant that secured $175K in funding for semiconductor research. To have a good chance of getting noticed by a hiring manager, your resume needs to highlight your skills in a way that it makes you stand apart from the competition. Not sure yours is doing a great job at that? Get a free resume evaluation today from the experts at Monster's Resume Writing Service. You'll get detailed feedback in two business days, including a review of your resume's appearance and content, and a prediction of a recruiter's first impression. Let the experts at Monster review your resume and help you land an awesome job.